The world's first certified CO2-neutral high-volume production plant in the premium segment will shortly begin production of the first fully electric series production Audi. Audi Brussels has been awarded a "CO2-neutral site" certificate by the Belgian testing company Vinçotte. The site covers all production processes and all other emissions generated at the plant either by renewable energies (approximately 95 percent) or compensates for them with environmental projects (approximately 5 percent). Audi Brussels will start production of the first all-electric series-produced model from the Four Rings before the end of this year. It makes a statement with a range suitable for everyday use and with innovative, digital technology on board. Audi pursues a holistic approach with regard to sustainable premium mobility. For this reason, the company attaches great importance to the resource-conserving production of its electric SUV. Right from the start of production, Audi Brussels will produce the series version of the Audi e-tron prototype with a CO2-neutral impact on the environment. The second pillar is the supply of heat at the site using renewable energies, also for heating the offices. The plant covers this heat requirement with certificates for biogas. 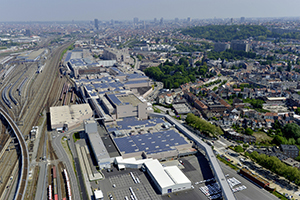 Audi Brussels prevents CO2 emissions of up to 40,000 tons each year through renewable energies. Pillars one and two thus account for more than 95 percent of overall energy needs.